We are a non-profit group that believes we can help you get the equivalent of an average of 215 hookups/weekend for your family's boat. That's what our President and Founder Dale averages, so why not you? We believe that successful anglers become the best protectors of fishing waters — that successful anglers who appreciate resources are key to ensuring a future we'll be proud to pass on. 34 Reasons We Hook So Many Fish. A Fishing Calendar developed specifically from your answers to your Preferences Survey. You'll identify your fishing preferences: where, when, what, how, with kids or without…and we'll plug these in to our massive database, from which we can extract your best choices. This calendar will help you plan better, catch more, and enjoy fishing more. Extensive written "Gameplans" and instructional video clips, for specific catching scenarios, on our web site, with experts like Dave Graybill. 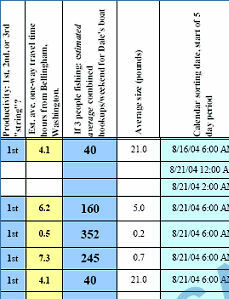 Personal coaching from Fishing Coaches: by phone or via email. The Latest Fishing News delivered in our newsletters, with announcements mailed to you and access through our web site. Our goal is to help you have better fishing in Washington, or Oregon, or British Columbia, or Northern Idaho, or Alaska. Whether you live in Seattle, the Puget Sound area, or Portland, or Vancouver, or anywhere in the Pacific Northwest. We do this by providing gameplans and fishing classes from experienced fishermen. 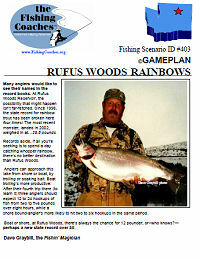 We provide fishing reports from our staff/contacts, Oregon fishing guides, Washington fishing guides, etc. And helpful links, such as to WDFW and ODFW regulations. We do both freshwater and saltwater fishing. Traditional tackle or fly fishing. We support Puget Sound Anglers, Trout Unlimited, and seven other non-profit groups. We especially encourage salmon conservation and trout conservation. Whether it's the Columbia River for sturgeon, or a lake for largemouth bass, we want to help you. Or King Salmon - aka Chinook, or Silver Salmon - aka coho, or the prolific humpy…we love salmon fishing. 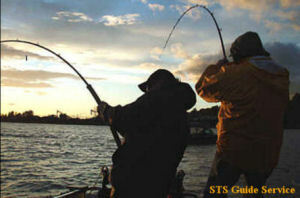 Do-it-yourself, or how about salmon charters, or guides for a guided steelhead trip? We have info on the Fraser River, Banks Lake (great waterskiing, too), Willamette River, Snohomish River, Lake Washington, Vedder River, Chilliwack River, Harrison River (great for chums), Skagit River, etc. Whether it's Washington fishing or Oregon fishing, or whatever, we want to help you! wrongly attributed or lacking proper acknowledgment, please inform us immediately. Thank you, Katie.